Are VMT and GDP Really Correlated? Driving less won't necessarily hurt the economy, data shows. Photo by Anita363. 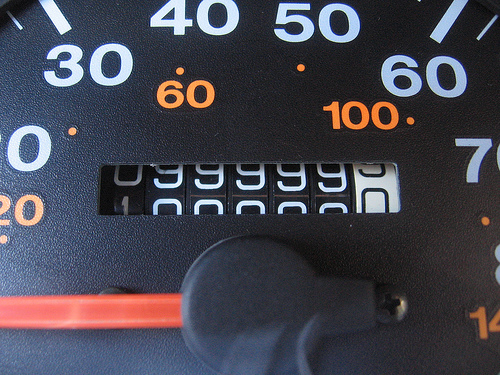 People tend to drive more when the economy is in better shape. Research has shown that vehicle miles traveled (VMT) and gross domestic product (GDP) tend to follow the same trends over time (see for example the Federal Highway Administration’s Summary of National and Regional Travel Trends: 1970-1995). Based on this evidence, someone could suggest that policies aiming to curb VMT growth can harm the economy. But this is not necessarily true. If we look at cross sectional data for the United States, published by the Federal Highway Administration (FHWA), and compare them with statistics from the Bureau of Economic Analysis (BEA), we notice that states where people drive more do not have higher per capita GDP, and vice versa. Mississippi, for example, has the second highest VMT per person in the nation (40 miles per day) yet it has the lowest per capita GDP, $24,000. Using official data from Eurostat, the European Commission’s Directorate-General in charge of statistics, we can find similar results for European cities and regions. 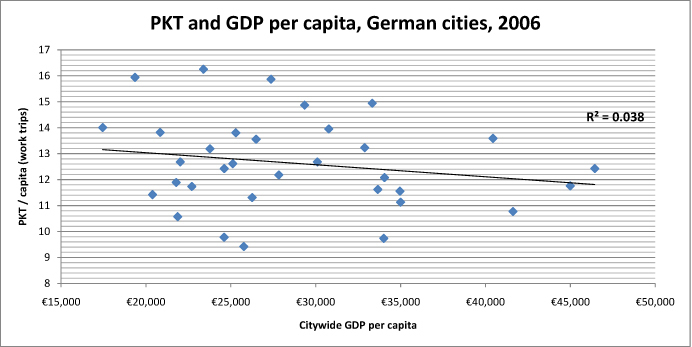 In German cities, for example, kilometers traveled per person (passenger kilometers traveled, or PKT) and citywide GDP per capita are not correlated. 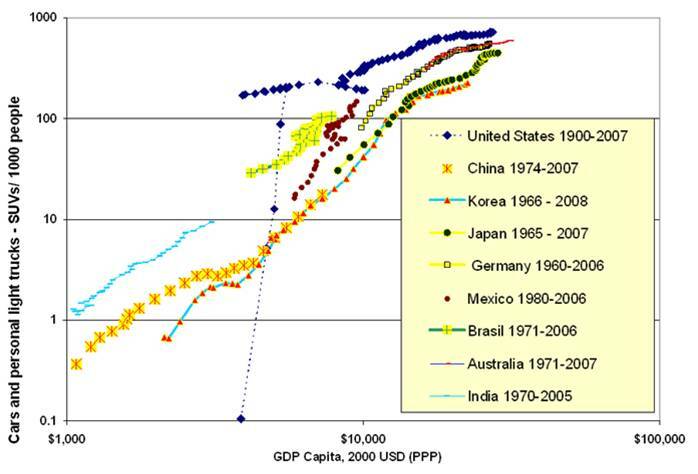 This is similar to Lee Schipper‘s finding that as GDP grows over time, so does car ownership (see graph below). However, as the same graph shows, countries or regions with similar GDP can have very different levels of auto ownership. While growth in auto ownership and VMT has followed growth in GDP over time, cities and regions with comparable GDP can have very different levels of vehicle ownership and use. This means that policies aiming to reduce VMT will not necessarily have an adverse impact on the economy.